Quad Cities private, semi-private, small group and mobile fitness and personal training! At 8 ONE 8 we provide personal training that is just that — personal. No two people are exactly the same and therefore, you should not be trained the same. We do not offer a “one size fits all” approach. We take the time to get to know you and create an experience that is as unique as you are. When you become a member, you have a choice to train in the privacy of your own home or in our private studio. Allow us to simplify your life. No more commuting to an overcrowded gym. No more trying to figure out what to do with the kids while you are at the gym — With our mobile training services, you can stay home and your kids can be right here “working out” beside you or napping peacefully in their room. It’s time to enjoy the ultimate luxury and convenience, and let the gym come to you! At 8 ONE 8 we are all about service and convenience, so don’t worry about your current equipment selection, either. Your trainer will bring along exactly what he/she needs to give you the best workout possible. Enjoy the areas only truly private personal training studio. When you opt to train in our ultra-convenient studio, you will enjoy 60 minutes that are all about you. We have eliminated all of the distractions of a typical gym or personal training studio — no more waiting to use equipment, no judgmental looks, no competing for your trainers’ attention. In our studio, it is just you and your trainer, allowing for the ultimate training experience. 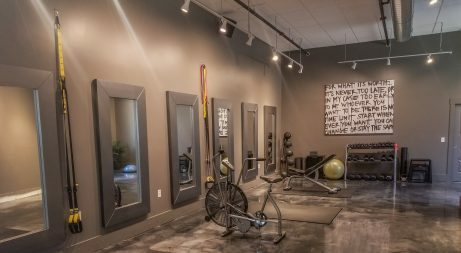 If you want to get the most out of your personal training program, our studio at 400 N Main is the place for you. Finally, the small group fitness class you have been waiting for has arrived! Monthly memberships on sale now! The small group class you have been waiting for has arrived! 818 FUSION is all about fast, fun, customized sessions designed to give you lasting results! With no more than 10 members per class, there is a high degree of personal attention and individualization tailored to each member. 818 FUSION will consist of truly high energy strength and conditioning intervals using dumbbells, TRX straps, body weight, resistance bands, cardio drills, and even some partner-based exercises. You probably won’t appreciate that personal attention as much as you should, though, since you’ll be too busy working hard and having a blast with Scott, Kristen, or Josh as you lunge and lift. Be challenged. Get sweaty. Have fun. TOGETHER. Who is 818 FUSION for? Anyone wanting personalized training, but on a budget or someone wanting the attention of one-on-one training and the camaraderie of group classes. At a fraction of the cost of our personal training, you’ll work out in small groups of up to four people. In our semi-private training program, you can even create your own private group session with two or three friends and enjoy access to our group training sessions or create your own. WARNING**We are going to try and over-deliver on service and experience to try and get you to not want to go anywhere else. Cool? Awesome! • new friends and A LOT of FUN! Ps – this is gonna be SO. MUCH. FUN. But for real – we’re awesome at transforming bodies and we want to show you our best stuff and transform you body and your life!